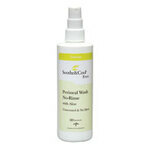 Soothe & Cool® Perineal No Rinse Wash - 8 oz. …Tetrasodium Edta, Citric Acid, Aloe Barbadensis Leaf Juice|||Usage Spray soiled and/or odorous areas, or apply directly to a wash cloth. Wash and wipe skin gently. Repeat as needed until all skin is clean. Pat dry. After cleansing, moisturize or protect skin with other Sooth & Cool products. …collared-shirt style ideal for men or women. Easy-to-clean, stain-resistant fabric keeps clothing underneath clean and dry. * Hook-and-loop closure fits necks up to 18”. * Adult bib measures 25 1/2” x 25”. * 50% polycotton/50% polyester. * Machine wash; air dry. * Do not bleach, iron or dry clean. …(fits waists 27"–28"), Large (fits 29"–31"), XL (fits 32"–37") or 2XL (fits 38"–42"). 70% nylon/30% elastane. Machine wash cold, tumble dry, no bleach.|||Size Chart |||Fabric & Care 70% Nylon/ 30% Elastane. Care Instructions: Machine wash cold. Tumble dry low heat. Do not bleach, iron or dry clean. 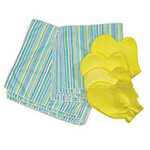 Bedding/Fabric Freshener by LivingSURE, 24 oz. …easy to put on and take off. * Sold individually to fit either right or left knee. * Measure above the kneecap, and choose from 4 sizes to fit most men or women: S (11–14"), M (14–17"), L (17–19"), XL (20–23"). * 45% spandex/45% cotton/10% latex silk. * Machine wash cold, inside out; tumble dry low. …the kitchen. Available in two floral prints, our one-piece cobbler apron has a snap front for easy on/off, and two front patch pockets. * Choose from 2 colors: blue floral or black floral. * Specify size: medium, large, XL, XXL or XXXL. * 55% cotton/45% polyester. * Machine wash and dry. * Imported. …chronic lower back and sciatic pain. * All-natural alternative to pain medication. 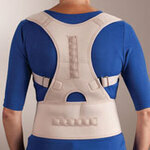 * Sciatic brace can be worn over or discreetly under clothing and stays in place. * Adjustable; one size fits most men and women. * 80% neoprene/20% polyester. * Hand wash; air dry. Do not bleach or iron. * Imported.